The straight-six engine or inline-six engine is a six cylinder internal combustion engine with all six cylinders mounted in a straight line along the crankcase. The single bank of cylinders may be oriented in either a vertical or an inclined plane with all the pistons driving a common crankshaft; in vehicles where this engine is installed inclined versus vertical, it is sometimes called a slant-six engine. The straight-six layout is the simplest engine layout that possesses both primary and secondary mechanical engine balance, resulting in relatively low manufacturing cost combined with much less vibration than engines with fewer cylinders. Usually, the straight-six design is used for engine displacements ranging from approximately 2 to 5 litres (120 to 310 cu in) in automobiles. It is also sometimes used for smaller engines but these, although very smooth running, tend to be rather expensive to manufacture in terms of power-to-cost ratio. Since the length of an engine is roughly proportionate to the number of cylinders in one bank (plus the width of one connecting rod in a "V" engine), they are inevitably physically longer than alternative layouts such as L4, V6, or V8. Because it is a fully balanced configuration, the straight-six can be scaled up to very large sizes for heavy truck, industrial and marine use, such as the 16 L (980 cu in) Volvo diesel engine and the 15 liter Cummins ISX used in heavy vehicles. The largest are used to power ships, and use fuel oil. Historically, straight-six engines were introduced much earlier than V6 engines. While the first straight-six was manufactured in 1903 by Spyker, it was 1950 before a production V6 was introduced. V6s (unlike crossplane V8 engines) had intrinsic vibration problems that were difficult to eliminate without modern computer aided design techniques. The length of the straight-six was not a major concern in the older front-engine/rear-wheel drive vehicles, but the modern move to the more space-efficient front-engine/front-wheel drive and transverse engine (left-to-right versus front-to-back) configurations in smaller cars made the length of the V6 (one half the length of an L6 with the same bore size, plus the width of one rod) a major advantage. As a result, in recent decades automobile manufacturers have replaced most of their straight-six engines (and many of their V8s) with V6 engines; Mercedes-Benz now uses V6 engines despite most of their lineup retaining the front-engine/rear-wheel layout. Exceptions to the shift to V6 engines include BMW, which specializes in high-performance straight-sixes used in a lineup of front-engine/rear-wheel drive vehicles, Volvo, which designed a compact straight-six engine/transmission package to fit transversely in its larger cars, and the Australian Ford Falcon, which still uses a straight-six configuration. Straight-sixes also continue to be commonly used in medium to large trucks, and sport utility vehicles, where engine length is less of a concern. In 2002 General Motors introduced the Vortec 4200 as part of the modular straight-four, straight-five and straight-six GM Atlas engine line. An MAN B&W 6S60MC inline six cylinder low-speed diesel engine. This example is used on a 70,000 t (deadweight) bulk carrier, and produces 9,014.8 kW (12,089.0 hp) at 90.3 rpm (1.5 Hz). An inline six engine is in perfect primary and secondary mechanical balance, which can be achieved without using a balance shaft. The engine is in primary balance because the front and rear trio of cylinders are mirror images, and the pistons move in pairs. That is, piston #1 balances #6, #2 balances #5, and #3 balances #4, largely eliminating the polar rocking motion that would otherwise result. Secondary imbalance is avoided because an inline six cylinder crankshaft has six crank throws arranged in three planes offset at 120 degrees. The result is that differences in piston speed at any given point in rotation are effectively canceled. An inline four cylinder or V6 engine without a balance shaft will experience secondary dynamic imbalance, resulting in engine vibration. As a general rule, the forces arising from any dynamic imbalance increase as the square of the engine speed—that is, if the speed doubles, vibration will increase by a factor of four. In contrast, inline six engines have no primary or secondary imbalances, and with carefully designed crankshaft vibration dampers to absorb torsional vibration, will run more smoothly at the same crankshaft speed (rpm). This characteristic has made the inline six popular in some European sports-luxury cars, where smooth high-speed performance and good fuel economy are desirable. As engine reciprocating forces increase with the cube of piston mass, inline six is a preferred configuration for large truck engines. Crankshafts on six cylinder engines generally have either four or seven main bearings. Larger engines and diesels tend to use the latter because of high loadings and to avoid crankshaft flex. Because of the six cylinder engine's smooth characteristic, there is a tendency for a driver to load the engine at low rpms. This can produce crankshaft flex in four main bearing designs where the crank spans the distance of two cylinders between main bearings. This distance is longer than the distance between two adjacent main bearings on a V6 with 4 mains, because the V6 has cylinder bores on opposite banks which overlap significantly; the overlap may be as high as 100%, minus the width of one connecting rod (1.00" or so). In addition, modern high-compression engines subject the crankshaft to greater bending loads from higher peak gas pressures, requiring the crankthrows to have greater support from adjacent bearings, so it is now customary to design straight-sixes with seven main bearings. Many of the more sporty high-performance engines use the four bearing design because of better torsional stiffness (e.g., BMW small straight 6's, Ford's Zephyr 6). The accumulated length of main bearing journals gives a relatively torsionally flexible crankshaft. The four main bearing design has only 6 crank throws and four main journals, so is much stiffer in the torsional domain. At high rpm, the lack of torsional stiffness can make the seven main bearing design susceptible to torsional flex and potential breakage. Note that a V12 engine can be made with the same number of crank throws as the seven main bearing straight-six, although each throw must be wide enough to accept the connecting rods of both opposing cylinders requiring either that each rod be far narrower, or that the crankshaft length be extended. Another factor affecting large straight-six engines is the front mounted timing chain which connects any camshafts to the crankshaft. The camshafts are also quite long and subject to torsional flex as they in turn operate valves alternately near the front of the engine and near the rear. At high rpm, camshafts can flex torsionally in addition to the crankshaft, contributing to valve timing for the rear most cylinders becoming inaccurate and erratic, losing power, and in extreme cases resulting in mechanical interference between valve and piston - with catastrophic results. Some designers have experimented with installing the timing chain/gears in the middle of the engine (between cylinders 3 and 4) or adding a second timing chain at the rear of the engine. Either method can solve the problem at the cost of additional complexity. Another factor affecting the ability of the large six cylinder engines to achieve high rpm is the simple geometric reality of a relatively long stroke (undersquare) design. A straight-six is a long engine, and the designer is usually encouraged to make it as short as possible, while height is not usually a problem. Hence, the tendency to use a longer stroke and smaller bore than in a V engine to achieve a given capacity. By contrast, a long-stroke V engine tends to become too wide, which encourages increasing the bore rather than the stroke to increase displacement. The typically longer stroke of the straight-six increases crank throw and piston speed, and so tends to reduce the rpm rating of the engine. The first inline six was produced by Spyker in 1903. By 1909, there were some eighty manufacturers using it, 62 in Britain alone, including Darracq, Delaunay-Bellville, Vertex, MMC, White and Poppe, Mutel, and Ford. BMW introduced its first straight 6-cylinder engine in 1933. It developed straight-six engines for the post-World War II era by adding two cylinders to its M10 four-cylinder design. In 1968, it introduced a M30 straight-six design with the same 30-degree slant, overhead camshaft layout, and 100 mm bore spacing as the four. It originally intended to follow up with a V8 engine line in the early 1970s, but when the 1973 oil crisis hit, BMW canceled its V8 plans and concentrated on refining and enlarging its straight-six lineup. These included a smaller straight-six in 2.0 and 2.3 litres (120 and 140 cu in) displacements (the BMW M20), versions of the larger BMW M30 up to 3.8 L (230 cu in) (the S38B38); and beginning in 1983, a series of M21 straight-six diesel engines. In 1986, BMW introduced the M70 V12 which was essentially two 2.5 L (150 cu in) straight-sixes on the same crankshaft. In the mid-90's, they produced a series of straight-6's based on the M50 architecture, the ultimate of which was the 330-360 hp S54, used up to 2006. BMW offered a straight-six for their following line up BMW 1 Series, BMW 3 Series, BMW 5 Series, BMW 6 Series, BMW 7 Series (Euro models), BMW X3, BMW X5, BMW X6, the retired Z3 and current BMW Z4. Mercedes-Benz has used straight-six engines in its cars for around 100 years, starting in the 1900s with a monstrous 10 L (610 cu in) engine producing 75 horsepower (56 kW). Before and after the merger of Daimler and Benz in 1926, the combined company produced a variety of powerful straight-six engines, culminating in a 7 L (430 cu in) supercharged unit producing up to 300 hp (224 kW). Mercedes-Benz began the post-war era by producing straight-fours, but resumed making straight-sixes in 1951 with the M130, which were the beginning of the modern era of MB straight-sixes. Following that introduction, the company produced two lines of petrol (gasoline) straight-sixes at any one time, a small six and a larger six, in addition to its straight-fours, straight-fives, and later V8s and V12s. Although the company has used diesel engines in its cars since 1934, it introduced its first straight-six OM603 a 3.0 L (180 cu in) diesel in 1985. In 1996, the company replaced its petrol straight-sixes with a series of 90-degree M112 V6 engines, although it continued to produce diesel straight-sixes. Volvo produced straight-sixes, the Volvo B30 engine (1969-1975), also the B6304 and the B6254 engines during late 1990s. As Volvo developed front-wheel drive models, they mounted their inline-six engine transversely by using a short transaxle package, and relocated engine-driven accessories. The 3.2 L (200 cu in) straight-six introduced in 2006 was only slightly longer than its straight-five, achieved by moving the camshaft drive to the back of the engine and sharing the same gear train with ancillaries mounted in otherwise unused space over top of the transmission. It was short for a straight-six and also very narrow. Volvo claims a transversely mounted inline engine leaves more crush space to protect against frontal impacts than a (shorter) transverse V6 or a longitudinally mounted inline-six. Opel has also used a straight-six engine since 1930s until the early 1990s, ranging between 2.5 and 4.0 L (150 and 240 cu in). They powered Opel's top of the line models, including the Admiral, Kapitän, Monza, Senator, Omega, and Commodore. In 1959, Saab had an experimental car with two transverse straight-three engines bolted together—the Saab Monster. Alfa Romeo used straight-six engine in G1 and G2 models (1921-1923), RL model (1922–1927) and between 1925–1954 in Alfa Romeo 6C series road and racing cars, the 1500 version had one of the smallest straight-six engines (1,487 cc/90.7 cu in). The last Alfa Romeo model using straight-six was Alfa Romeo 2600 (1961–1969). The straight-six was the archetypal British engine for sports and luxury cars for many years. Rolls-Royce used straight-six engines until changes in their design made the shorter V8 engine layout more suitable. Jaguar and other manufacturers built straight-six engines from 1935 until the 1990s. The most prominent of these was the Jaguar XK6 engine, which reportedly was developed during long nights during World War II when Jaguar founder William Lyons and his staff were on fire watch duty in the Jaguar factory in Coventry, and had nothing better to do than design a new engine. The result was displayed in the Jaguar XK120 at the London Motor Show in 1948. The 3.4 litres (210 cu in) twin overhead camshaft XK6 engine engine was highly advanced compared to previous British engines. The Jaguar XK120 and the XK-powered Jaguar C-Type and Jaguar D-type, went on to score victories in races and rallies in the UK, Europe and North America. They dominated the 24 Hours of Le Mans during the 1950s, where Jaguar C-Types won in 1951 and 1953, and the D-Types had three more wins in 1955, 1956 and 1957. Subsequently, fitted to Lister Cars Lister-Jaguar, the D-type engine contributed to their success in international sportscar-racing in the late-1950s. The engine design, enlarged to 3.8 L (230 cu in), reached its apogee in the Jaguar E-type introduced in 1961, which was capable of 150 mph (240 km/h). In 1964, the XK engine was again enlarged to 4.2 L (260 cu in), which was considered the most powerful and refined of the series. The last XK-engined Jaguar went out of production in 1986, but some XK engined cars such as the Daimler DS420 limousine were still available into 1990s. A variant of the 4.2 litre engine powered some Scorpion light tanks. The XK6 engine was followed by the AJ6 and AJ16 engines. After Jaguar was acquired by Ford, these engines were replaced with the Ford Duratec-derived Jaguar AJ-V6 engine. Aston Martin used a straight-six for many years, as did Austin-Healey in their Austin-Healey 3000. The latter used an engine originally built for the Austin Motor Company A105 saloon. Jensen also used Austin straight-six engines in their post WW-2 cars until 1962, re-engineering the Austin Sheerline's 4 litre DS range to increase the power output. MG also used a straight-six in some pre-WW2 cars (examples: MG K-type and MG N-type) and more recently in the MGC. Bristol produced a straight-six until 1961, based on a BMW design, that was also used by many small automakers. Prior to WW2, Riley built a number of models fitted with straight-six engines, including the Kestrel 12/6 saloon and the MPH roadster. The Rover SD1 saloon used a Triumph designed straight-six of 2.3 and 2.6 L (140 and 160 cu in) capacities as its base and mid-range engines. British sports car company TVR designed its own straight-six, known as the Speed Six, which was also used in the Sagaris, with its capacity of 4 L (240 cu in). At 405 hp, it is the most powerful naturally-aspirated straight-6 ever fitted to a regular production car, though some turbocharged engines are considerably more powerful (notably, the Toyota 2JZGTE and Nissan RB26DETT). The Rover Company used straight-sixes in many of its saloon cars. A family of straight-4 and straight-6 engines with an unusual 'Inlet-Over-Exhaust' layout were developed. Introduced in the 1930s, these engines were used with great success in Rover's post war cars (the 'P3', 'P4' and 'P5' models). The sixes were available in a variety of capacities- 2.1 L (130 cu in), 2.2 L (130 cu in), 2.3 L (140 cu in), 2.6 L (160 cu in) and 3.0 L (180 cu in). In 1968 Rover began offering the 2.6-litre engine as an option in long-wheelbase variants of its Land Rover 4x4. The engine remained available in the Land Rover until 1980, long after production of the other versions of the Rover IOE straight-six had stopped. Ford UK produced a straight-six engine for the Zephyr and Zodiac range of passenger cars from the Mk1 of 1951 (2262 cc) through the Mk2 (2,553 cc/155.8 cu in) and Mk3 until 1966. The straight-six was a four main bearing 12 overhead valve design with a short stroke. Rated output grew from just 65 horsepower (48 kW) in the Mk1 to 110 hp (82 kW) in the Mk3 Zodiac. Engines of this type were popular before World War II in mid-range cars. Most manufacturers started building straight-six engines when cars grew too large for the inline-four engine. After World War II, larger cars required larger engines, and buyers of larger cars tended to prefer V8s; performance sixes such as the Hudson Hornet 308 cu in (5.0 L) engine were exceptions to the rule, and were not often top sellers although it became one of the hottest cars on the road and dominated stock car racing (NASCAR) in the early Fifties. After Chevrolet introduced its V8 in 1955, the straight-six became almost exclusively a base engine model pitched to economy-minded customers. Trucks (both light and heavy duty) also incorporated the straight-six until the mid-1950s, and they are still used in light trucks available today. The new wave of compact cars that started in the late 1950s provided a suitable home for straight-six designs. The Chrysler Corporation had noteworthy slant-6 engines, used in the Plymouth Valiant and Dodge Dart A-body models of the 1960s and 1970s. This engine was reliable and achieved some success in racing after engineers discovered that the 30-degree slant of the engine allowed them to use very long intake ports to boost horsepower by tuning the intake system. Part of the reason for its reliability was that it was originally designed to be built of aluminum, but after Chrysler had problems with manufacturing the engines in aluminum, the rest were built in cast iron without changing the design to compensate for the stronger metal. Although it only had four crankshaft main bearings instead of the seven used by its competitors, they were the same size as those on the 426 cu in (7.0 L) Hemi V8. After 30 years of production, it was discontinued in favor of V6 engines because it was too long to mount transversely in front wheel drive cars. A significant step was taken by Kaiser Jeep with the 1963 Tornado straight-6, the first U.S. designed mass produced overhead cam (OHC) automobile engine. It was robust and built for heavy-duty performance, as well as featuring the lowest specific fuel consumption of all production gasoline engines in the market at the time. However, it was complex (by 1960s standards) for civilian vehicles in the U.S., but continued to be installed in military Jeeps and was also produced through 1982 by IKA in Argentina. Another noteworthy straight-six engine family was introduced by American Motors (AMC) in 1964. These AMC Straight-6 engines were used in a variety of AMC passenger and Jeep utility vehicles. American Motors also sold their straight-sixes to International Harvester to be used in International's "Light Line" vehicles: Scouts, pickups, and Travelalls. These engines were also assembled and marketed internationally. Some markets (such as Vehiculos Automotores Mexicanos (VAM) in Mexico) built their own specialized versions. This engine is considered to be one of the best ever made and it received modifications and upgrades as engine control technology improved. It is noteworthy that this "modern era" I-6 was produced continuously for 42 years (even after Chrysler's buyout of AMC in 1987) all the way through 2006. It featured a durable design with a cast iron block and cylinder head, hydraulic lifters (with non-adjustable rockers), and seven main bearings. Since AMC cars were designed to take the weight of an optional V8, AMC was able to make their straight-sixes much stronger and heavier than they needed to be. As a result, the engine blocks were so sturdy that some were used in race cars in the Indianapolis 500. In the 1978 race, an AMC 199 cu in (3.3 L) engine built by Navarro produced 875 hp (652 kW) at 8,500 rpm (140 Hz) with 80 in (2,000 mm) of manifold pressure. Ford and General Motors straight-sixes of the 1960s and 1970s were generally nondescript, except for the unusual (for the United States) OHC Pontiac six of the late-1960s. Although it was one of the few American straight-sixs of its era to be advertised as exceeding 200 horsepower (149 kW), it wooed few performance buyers away from V8s during the muscle car era, and was eventually discontinued in favor of a less costly but less powerful pushrod design. American automakers found it more profitable to sell slow-speed straight-sixes as "economy" engines, and V8s as "performance" engines regardless of their horsepower potential, since big, unsophisticated, overhead valve engines were relatively cheap to manufacture, and fuel economy was not a concern prior to the 1973 oil crisis. The trend after the fuel crises in the 1970s was towards smaller cars with better fuel economy. Despite this, straight-six engines became rare in American cars, although they continued to be used in trucks and vans. The decline of the straight-six was in response to the more compact size of the V6 layout. The straight-six required a longer engine compartment that was more appropriate to a larger car. The shorter V6 could be used in a shorter engine compartment and therefore fit better in a more compact car. It was also relatively easy to cut two cylinders off a V8 design to produce a V6 that could be manufactured on the same assembly line as the V8, which was convenient for American manufacturers. Jeeps were an exception to the trend to V6s, and began offering AMC's 258 cu in (4.2 L), known as "High Torque," straight-sixes as a common engine option in 1972. These engines continued to receive upgrades which were advanced for their time, high-performance 4.0 L (240 cu in) option in 1987. Usage of the AMC 4.0 declined in Jeep vehicles after the Jeep Cherokee (in North America) was replaced by the Liberty in 2002, which featured Chrysler's 3.7 L (230 cu in) V6 instead. It declined further after the 2005 introduction of the third generation Jeep Grand Cherokee, which also used the 3.7 L (230 cu in) V6. The last application of the 4.0 was in the 2006 Jeep Wrangler; for 2007 the engine has been replaced with a 3.8 L (230 cu in) V6. Ford used a straight-six in baseline Mustangs and in its other models for many decades. They were also found in F-series pickups, E-series vans, and Broncos (most notably the venerable Ford 300 inline six) until 1997 when they were replaced with a V6. In 1989, Chrysler introduced the 5.9 L (360 cu in) Cummins B Series engine as an option on its pickup trucks. Displacing nearly 1 litre per cylinder, this straight-six turbocharged diesel engine was an attractive alternative to the big gasoline V8s normally used on full-sized pickups, because its better fuel economy and nearly twice as much low-speed torque. 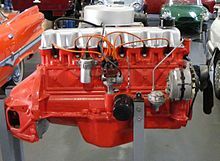 The usual marketing cachet of competing V8s from GM and Ford was offset by the "real" truck origin of the Cummins engine because earlier GM diesel V8s derived from gasoline engines had reliability problems. In 2001, General Motors introduced a new family of straight engines, the Atlas, for use in the Chevrolet TrailBlazer/GMC Envoy. The straight-six was chosen for development because of the desirable operating characteristics of its self-balanced design. Japanese automakers have used the straight-six since the 1960s in a wide range of vehicles. More recently though, Nissan and Toyota have changed to V6s, saying the straight-sixs were too long and expensive to manufacture for the engine compartments in their newer vehicles. The Nissan Skyline GT-R also used this layout and so had a long hood. Toyota started with their F-series engine, and later the M, FZ, G, and JZ engines, and Nissan started with their H-series, and later the L of the early Fairlady Zs as well as the RB series engines (in the R31-R34 Skyline). Honda built the Honda CBX1000 motorcycle from 1978 to 1981. In the 1990s, Toyota offered straight-sixes in all their lines: the G in the Altezza (and others); the M and its part-replacement, the JZ, in the Toyota Supra (and others); and the F and its replacement, the FZ, in the Land Cruiser. In the 2000s, Toyota still offers the FZ-series, G-series, and the JZ-series engines. Suzuki introduced the Verona a mid-sized front wheel drive car in 2004 with a straight-six and discontinued it 4 years later. In Korea, GM Daewoo's FWD Magnus (sold abroad as the Chevrolet Evanda, Chevrolet Epica, Holden Epica or Suzuki Verona) comes with a Daewoo-designed straight-six. The Daewoo engine is one of the few straight-sixes designed to be installed transversely in front-wheel drive cars, and it is an extremely short engine in its configuration. Historically, all major manufacturers in Australia used straight-six engines. Chrysler had built the Slant 6 in Australia, and the unique to Australia Chrysler Hemi-6 Engine. These engines, made in 215 cubic inches (3.52 L), 245 cu in (4.01 L), and 265 cu in (4.34 L) capacity, were used in the Chrysler Valiant and the Valiant Charger producing up to 320 horsepower (239 kW). Chrysler no longer owns any factories in Australia. Holden up until 1986 built their own straight-sixes, adapted from a Chevrolet design. A 132.5 cu in (2.171 L) unit (known as the grey motor) was used until 1963, with a minor increase in displacement in 1960 to 138 cu in (2.26 L) when it was replaced by a newer Chevrolet based design (known as the red engine) which was offered in different capacities. Holden engine sizes included the 138 cu in (2.26 L), 149 cu in (2.44 L), 179 cu in (2.93 L) (1964-1966), 161 cu in (2.64 L), 173 cu in (2.83 L) (1971-1984), 186 cu in (3.05 L) (1968-1971), and 202 cu in (3.31 L) (1971-1986, the largest and most popular of the series). This motor was firstly replaced by an imported RB20/30 Nissan straight-six, offered in 2.0 L (120 cu in) (in New Zealand) and 3.0 L (180 cu in) forms, until Holden's Buick designed 3.8 L (230 cu in) V6 replaced it outright in 1988. Holden now make and use the new global HFV6 in their local and export passenger cars. Ford Australia has been producing straight-sixes since 1960, and is the only manufacturer in Australia to still build straight-sixes. Ford has built 144 cu in (2.36 L), 170 cu in (2.8 L), 188 cu in (3.08 L), 200 cu in (3.3 L), 221 cu in (3.62 L), 240 cu in (3.9 L), and 250 cu in (4.1 L) engines, with the 240 being called the 3.9 L (240 cu in), or 4.0 L (240 cu in) and the 200 being called the 3.3 L (200 cu in). They have been used since 1960 in the Falcon, 1972-1981 in the Cortina, and from 2004, in the Ford Territory. The current straight-six engines in the Falcon and Territory are called the Barra and have a 4.0 L (240 cu in) displacement. The high-performance division of Ford Australia, Ford Performance Vehicles, produce vehicles equipped with the 4.0 L (240 cu in) 24-valve dual overhead camshaft (DOHC) turbocharged straight-six with variable cam timing, which produces 416 hp (310 kW) at 5,250 RPM (87.5 Hz) and 565 N·m (417 lb·ft) at 1,950 RPM (32.5 Hz)—the highest level of torque in any Australian production car to date. Honda raced a number of straight-six engines in the Honda RC series of motorcycles, starting with the 249 cc (0.249 L) 3RC164 in 1964, with a bore of 39 mm, and a stroke of 34.8 mm. This became the RC165 in 1965. For 1966, bore and stroke became 41 mm and 31 mm in the RC166, continuing with the RC167 in 1967. Also in 1967, Honda raced the straight-six 297 cc (18.1 cu in) RC174 in the 350 class, with bore and stroke of 41 mm and 37.5 mm. For road use, Honda introduced the Honda CBX1000 in 1978. Kawasaki introduced the 1,300 cc (79 cu in) KZ1300 in 1979. Benelli introduced the 750 Sei in 1976, which was later enlarged to 900 cc (55 cu in) to become the 900 Sei. BMW has developed a straight six engine for motorcycle use, debuting in a concept bike in 2009. The straight-six in diesel engine form with a much larger displacement is commonly used for industrial applications. These include various types of heavy equipment, power generation, as well as transit buses or coaches. Virtually every medium-duty to large over-the-road truck employs an inline-six diesel engine. Its virtues are superior low-end torque, very long service life, smooth operation and dependability. On-highway vehicle operators look for straight-six diesels, which are smooth-operating and quiet. Likewise, off-highway applications such as tractors, marine engines, and electric generators need a motor that is rugged and powerful. In these applications, compactness is not as big a factor as in passenger cars where reliability and maintainability are much more important concerns. As with everyday passenger vehicles, the smooth running characteristics of the straight-six engine are what make it desirable for industrial use. The straight-six is a simple engine that is in both primary and secondary balance. This means it can be scaled up to very large sizes without causing excessive vibration. Most of the engine components and accessories can be located along both sides, rather than on top of or underneath the cylinder banks, means that access and maintenance is easier than on a V engine in a truck or industrial configuration. In addition, a straight-six engine is mechanically simpler than a V6 or V8 since it has only one cylinder head and in the overhead camshaft configuration has only half as many camshafts. Notable versions include Toyota's normally-aspirated 2H and 12HT turbo from the 1980s, and the similar 1HZ 4 or 4.2 litre. The 5.9 and 6.7 liter straight-six Cummins found in the Dodge Ram and the DT series Navistar DT Engine of inline 6-cylinder medium-duty diesels by International Truck and Engine Corporation, are widely praised for use in the North American truck market. Caterpillar makes also engines in same displacement range for automotive, industrial and marine applications. Diesel straight-sixes are also found in passenger cars, most notably those made by BMW. The twin-turbo M57 produces up to 272 bhp (203 kW; 276 PS) from its 3 litre capacity, and it has won International Engine of the Year awards. Nissan produced a range of straight-six diesels to be used in their vehicles. Some examples would be the Nissan RD engine, or the Nissan TD engine, which have similar characteristics to the RB engines. However, the RD engine was designed to be quiet, efficient and smooth, so it could be fitted to a range of Nissan luxury vehicles, such as the Nissan Laurel, and power output suffered as a result of these requirements. ^ "The 2002-2009 Dodge Ram Heavy Duty". Allpar, LLC. 2009. http://www.allpar.com/model/ram/ram-heavy-duty.html. Retrieved 6 August 2009. ^ Greg Williams (November/December 2009). "1981 Honda CBX". Motorcycle Classics. http://www.motorcycleclassics.com/motorcycle-reviews/1981-honda-cbx.aspx. Retrieved 11 November 2009. ^ Davis, Tony. (1987). Aussie Cars. Sydney. Marque Publishing. ISBN 0 947079 01 7. ^ Robson, Graham. (1987). The Cars of BMC. Croydon. Motor Racing Publications. ISBN 0 947981 14 4. ^ "BMW Will Manufacture Inline Six-Cylinder Tourer: Previewed by the Concept 6". Motorcycledaily.com. http://www.motorcycledaily.com/10november09_bmw_tourer.htm. Retrieved 2010-03-01. Cheetham, Craig (2006). Ultimate American Cars. MotorBooks/MBI. ISBN 9780760325704. http://books.google.com/books?id=y6DUvUpGmn0C&pg=PA209&dq=largest+six-cylinder+engine+automobile&ei=0_GySPSVE4TYyASNsKCABw&sig=ACfU3U0ii7kp7Um_26OHGh68mTEjdJCQLQ. Georgano, G.N. (1985). Cars: Early and Vintage, 1886-1930. Grange-Universal. Nunney, M J (2006). Light and Heavy Vehicle Technology, Fourth Edition. Butterworth-Heinemann. ISBN 0750680377. Walke, Todd. "The Most Powerful Diesel Engine in the World". http://people.bath.ac.uk/ccsshb/12cyl/. Retrieved 25 August 2008. "New six-cylinder engine from Volvo". Fosfor Wheels. 2006. http://wheels.fosfor.se/new-six-cylinder-engine-from-volvo/. Retrieved 11 January 2008. "Fifty Years of XK History". AutoWeb. 25 February 1998. http://autoweb.com.au/cms/A_50342/title_Fifty-Years-of-XK-History/newsarticle.html. Retrieved 9 January 2008. Roberts, Andrew (19 June 2007). "Classic Cars: The Hornet". The Independent. http://classified.independent.co.uk/cars/article2667213.ece. Retrieved 10 January 2008. Wilson, Michael. "American Motors and the Indy 500". http://www.geocities.com/mmbb444/page32.html. Retrieved 5 August 2007. Zatz, David. "1987, 1988, and 1989 Jeeps: Wrangler, Cherokee, Wagoneer, and Pickup". http://www.allpar.com/amc/1987-1989-jeep.html. Retrieved 10 January 2008. "4200 Overview" (PDF). General Motors. 2000. http://media.gm.com/division/powertrain/news/4200_Overview.pdf. Retrieved 5 February 2008. "Honda's Race History - 1965". Joep Kortekaas. 2002. http://www.vf750fd.com/Joep_Kortekaas/1965.html#RC165. Retrieved 21 January 2008. This page was last modified on 10 June 2010 at 20:28. Mayberry just recited the old saying the helped mechanics remember the firing order of any inline six-cyliinder engine: 1-6-3-5-2-4. It should be noted that not ALL six's share that firing order, but back in the days when the majority of engines powering cars and trucks (at least in the US) were inline six's, that was the firing order. I wanted to comment on something that our illustrious host quoted at the beginning of this article. 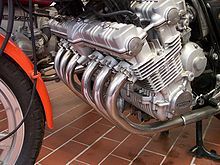 "The straight-six engine or inline-six engine (often abbreviated I6, L6 or R6)..."
The letter designation preceeedig the number in his examples do NOT denote an inline six cylinder engine, but rather, other aspects of the engine. The letters "I" and "L" refer to the type of cylinder head used. "L" being a flathead, "I" referring to an overhead valve design. "R" is actually in reference to the cylinder arrangement of an engine and stands for the word "Radial". A Radial engine has its cylinders arranged around the edge of the block, in a circular pattern. Older airplane engines are the best examples of a Radial engine. WWII airplane fans may recognize the terms "R-1830" or "R-1820". These were radial engines that powered many aircraft during the WWII era. You are correct about the L designation, and the I and R makes sense too: although there wouldn't be an R6 because, unless I am mistaken, radial engines must have an odd number of cylinders to work. Anyway, I removed that part. BTW, the saying is "15 too young, 36 too old, 24 just right" for 1-5-3-6-2-4. I have not been able to find any inline six that doesn't use this firing pattern; even a 2-stroke 6-71 Detroit Diesel uses this pattern. Can you name one that doesn't? If so, I would like to know about it so I can research it and find out why not. The thing is, the simplest way to build an inline six crankshaft happens to result in a naturally balanced engine, and the crankshaft determines the firing order. The inline six is the only engine design this is true of, as far as I know. Actually, Tracey, now that I think with a little clearer head (I was kinda tired that night), the "R" designation in that example is probably more indicitive of a Wankel-designed Rotary engine, as I myself demonstrated that Radial's tend to be designated by arrangement, followed by total displacement. However, if I recall correctly, the designation "R6" would then identify a 6-lobed rotary engine and such a thing, I've never heard of. All of the rotary's that I'm aware of are either a 1 or 2 lobe design (although GM planned on creating a 4-lobed rotary in the early 1970's). You are correct in that most radial's do use an odd number of cylinders, however, in cases of utilizing multiple banks of cylinders, it sometimes ends up as an even number of cylinders (for instance, two banks of 3 cylinders would be a 6 cylinder radial). Also, thanks for the correction on the inline firing order. As far as I know, that firing order is correct for all inline six's, however some V-6's do use a different firing order. 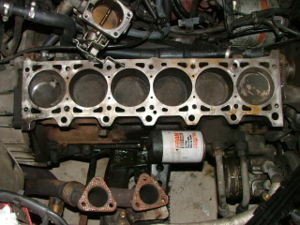 For instance, the GM 2.8L V-6's firing order really is 1-2-3-4-5-6. I added that part in my response, because I wanted to clarify that not all 6-cylinder engines (inline, or otherwise) use that firing order. The thought being that the reader may come to the conclusion that there is only one firing order for any 6-cylinder engine. Lastly, about the naturally balanced engine - that is also true of any V-12, and possibly the W-18 design, although I'm not familiar enough with the W block engine to know for certain. ...btw, Tracey, I'm Dean and its a pleasure to meet you. Thanks for creating a wonderful ode to the straight-six engine. If no one's mentioned it yet, you really have done a great job here. for a discussion of V6 engine designs.